A circle is a set of points equidistant to a point called the center of the circle. As I go around to give trainings and lectures , I usually hear the wrong definition below. I am not sure where this definition originated, but this is wrong. Wrong Definition: A circle is a polygon with infinite number of sides. If you look at the definition of a polygon (see Wikipedia), it is a region bounded with a finite number of straight lines (sides). So, if you say that a circle is a polygon with infinite number of sides, it is already a contradiction. Therefore, remember from now on that a circle is NOT a polygon and it has no side. Below is a circle with center O. A circle is usually named using its center, so we can call it circle O. A segment from the center of a circle to a point on the circle such as is called radius (plural is radii, pronounced as raid-yay). 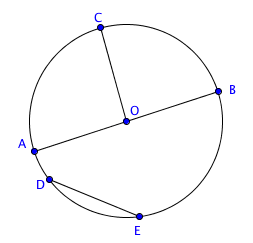 A segment joining two points on the circle such as is called chord. The longest chord that can be made in a circle passes through the center. This chord is called diameter. In the figure above, is a diameter of circle O. Since and , we can also say that . Note that the circle itself (the path itself from B going around back to B) is also called circumference. In the next post, we are going to discuss how to calculate the circumference of a circle.